Let’s try to see what is most important in our life. Is it to accumulate wealth ? Is it to gain power or have a hold on others? Is it to defeat those who harm us or hate us? Is it the pursuit of pleasure ? The consequence of all this will lead to even more disappointment and suffering, and contribute to our restless wandering by the accumulation of negative actions. 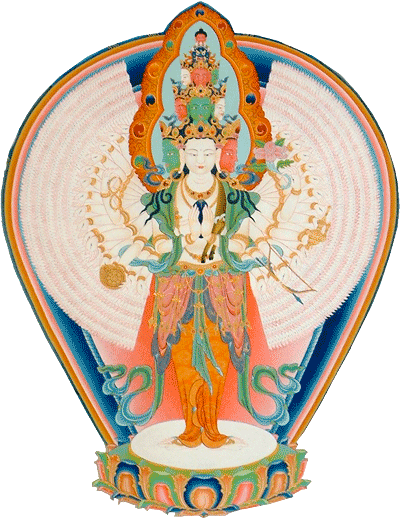 If instead we understand the futility of it all, we will rather seek the essential: the internal development of a genuine altruism, of contentment, of relaxation and letting go, of mindfulness … That way, we will gradually awaken from this lack of consciousness and walk along the path towards Enlightenment as the Buddha Shakyamuni. The Garden of Great Compassion is a hermitage who offers meditation retreats throughout the year. Guided by a qualified teacher, they enable everyone, within a group, to develop and deepen the Path to Enlightenment according to the teachings of the Buddha. In an environment of mountains, peaceful and favorable for meditation, this place is located in a high valley, the Champsaur, South of Park des Ecrins, in the Hautes-Alpes. During the retreats, the instructions are given on a continuous transmission line and are designed to recognize the nature of mind. Meditation through relaxation and opening, enables a deep understanding of the true nature of the mind. Thus it is possible to get rid of the suffering inherent in all existence. Developing and maintaining love and compassion for all beings and aspiring to enlightenment and liberation from suffering, include all the essential aspects of the Path. The Buddha who came to our world 2500 years ago, wanted to show us the Path to the Ultimate Truth and Authenticity. That is why those who practice the path of enlightenment consider him as their Master and are directly related to him. He did not guide us towards belief or superstition, but on the contrary towards a way of responsibility, a personal and inner commitment way of mindfulness. Far from delusive promises, this path is that of everyone, it belongs to no one and yet it belongs to all who seek a true way. It does not belong to a people or a particular country nor to a particular language, nor to the masculine or feminine gender. The path that the Buddha taught is absolutely universal and can be suited to each one according to his aspirations and needs. Transmissions and the way of teaching refer directly to the authentic Sutras and Tantras of the Buddha, without nevertheless getting lost in a kind of sectarianism. One must note also that this path is far from the quackery which flourishes nowadays and which provides magic and illusory methods that only mislead others. The Buddha Path is based on ethics, morality, right behaviour that do not harm others. It leads us to a profound awareness of our own nature and of the world around us. Through the development of awareness, alertness and giving up grasping, it enables us to recognize our true nature which is beyond any conceptualization and expression. By putting it into practice, there is no doubt that we will see the benefits appear within ourselves. Each of us has the opportunity to enjoy the fruits of such a practice, we just have to practice and give it the essential part of our lives, rather than use it as a minor occasional exercise to obtain a personal well-being and comfort. The consequence of all this will lead to even more disappointment and suffering, and contribute to our restless wandering by the accumulation of negative actions. If instead we understand the futility of it all, we will rather seek the essential: the internal development of a genuine altruism, of contentment, of relaxation and letting go, of mindfulness … That way, we will gradually awaken from this lack of consciousness (Skrt avidya., Tib. ma rigpa ) that was there in our inner stream for an eternity and walk along the path towards Enlightenment as the Buddha Shakyamuni. Grasping the reality of the self is the source of ignorance and on this basis all the emotions and disruptive passions develop. To solve this, it is necessary and essential to train, first in the calm of a suitable place, by sitting down in a relaxed way in order to recognize directly the cause of all our troubles, and second, then, to continue our training in our daily life. Because we must not cut off from the world we usually experience, but gradually our way of looking and our analysis will evolve towards greater openness and better understanding. Thus we will develop confidence in these teachings that the true Master, the Buddha, has purely conveyed to us through the centuries, and enriched by the experience of successive Masters of the various transmission lines free of taint and corruption. Here, the Lama who gives the Teachings, belongs to an uninterrupted authentic spiritual transmission line, the Karma Kagyu Lineage (the Lineage of Oral Transmission of Enlightened Activity). To be able to teach, he himself received the complete transmission, that he assimilated it. He then complied with the injunction of his Masters to now transmit everything they had given to him. It is up to everyone to escape the clutches of self grasping, by persevering in the inner view while being guided on the Path in the right way. As for the practice, the most common mistake is about meditation. The word is badly chosen, we should rather talk about non meditation. Because the training is to no longer make up anything and to let the mind remain in a perfectly natural and unaltered state. It is not at all to create in the mind an artificial state of calm and well-being that will not withstand the slightest inner or outer disturbance. The crucial teaching is Mahamudra, the Great Seal, which means the recognition of the unaltered innate nature of the mind. This simple and direct teaching suits well our time and our situation. It is easy to understand, but it can be difficult to apply because our troubles and our afflictions prevent us from getting to the simplicity devoid of making up. Yet with practice and patience, all those touched by this teaching can see for themselves the benefits. Especially, we have in heart to ensure that the valuable Teachings of Gendun Rinpoche remain alive and continue to spread, particularly the teachings on the development of the altruistic Enlightened Mind, the Mahamudra (Tib. Tchag Gya Chenpo, the Great Seal) and the Maha Ati (Tib. Dzogchen, the Great Perfection) which he held very dear and he urged us to transmit them without any restriction or restraint. It is a great joy for us to welcome you and to simply share with you our experience.